Before I knew anything else about it, I knew My Friend Pedro looked cool. I first came across the solo-developed indie game while going through the Screenshot Saturday hashtag on Twitter several years ago. 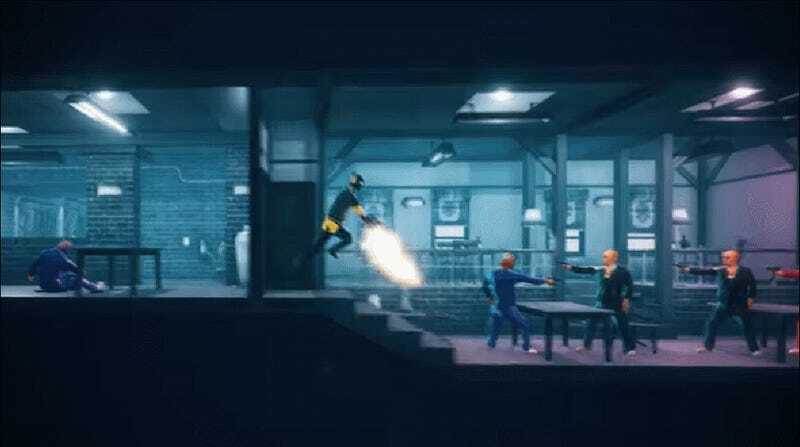 Among all of the images of games in development shared by their makers was a masked man pirouetting through the air while dual-wielding pistols and unloading them with perfect precision. My Friend Pedro is full of so many cool moments like these that creator Victor Agren made the game automatically generate GIFs that can be shared online while you’re playing it. Not only does My Friend Pedro look really cool, it wants to make you feel really cool as well. 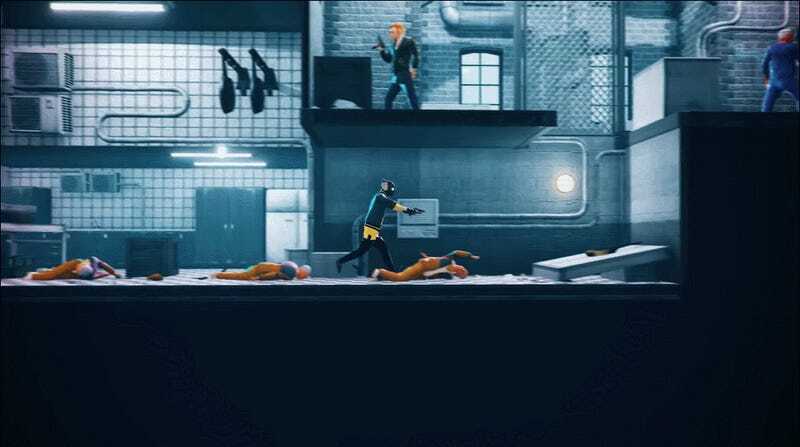 The 2D side-scrolling bullet hell game has you platform through buildings and across rooftops while bleeding one mob of enemy henchman after another. Pedro is a banana who not only talks but can embed himself in the faceless man’s skull to give him the power to slow down time. This ability is the basis for the game’s action moments. While the length of time you can slow down is limited by a meter, it’s generous. Agren told me when I demoed the game that he wanted players to have fun rather than be worried about constantly trying to manage a scarce bullet time-like resource. The game is floaty, but it works, allowing you the maximum amount of hang-time to pull off gruesome stunts. In addition to feeling like a skateboarding game at points, My Friend Pedro also just plain has skateboards in it. In addition, the man you control has split aiming, meaning you can select a target, lock it in, and then swivel in another direction to aim the second gun. This makes it possible to dive through rooms Matrix-style and take out multiple targets at once. Your character can also jump off walls and is unusually adept at doing flips, so you can also weave through the air with the grace of a Cirque Du Soleil performer while your dual-uzis tear up the room with some dazzling debris effects. All of this makes playing My Friend Pedro more like shredding on a halfpipe in an old Tony Hawk game then the gorefest it technically is. Superlatives pop up on screen when you pull off an unusually astounding maneuver or kill enemies in an especially brutal and efficient fashion. The game tallies up your score at the end of each level based on these things, as well as stuff like whether you killed every enemy in under a certain amount of time. You get bonus points if any of these kills are extra special, like coming by way of by bullets ricocheting off a frying pan that’s flying through the air. Of course, getting the hang of this mix takes some time. The beginning of the demo was straightforward, with me entering a room, jumping into the air, slowing down time, selecting both my targets and then going ham on the trigger buttons. Not soon after, I found myself struggling to juggle the split aiming, bullet time, aerial acrobatics, a pirouette that doubles as a dodge, and melee kicks as the game threw more and more enemies at me. It reminded me of trying to play the drums. Every level in the game will offer its own platforming bullet puzzle, but figuring them out requires unraveling how to line up all of your abilities so that what results looks stylish. I got close a couple times, but other players will no do astounding things when the game comes to PC and Switch next year. Bullet Time Isn&apos;t Just A Fictional Badass Move. It&apos;s A Real Thing.